Tired of digging through your stacked fabric stash? Me too! So instead, organize it with vertical fabric storage using foam board! For the entire month of April, 11 bloggers will be sharing the process of cleaning and organizing drawers around our homes each week. We kicked off the first week in the kitchen and I shared my 5-step Junk Drawer Organization. 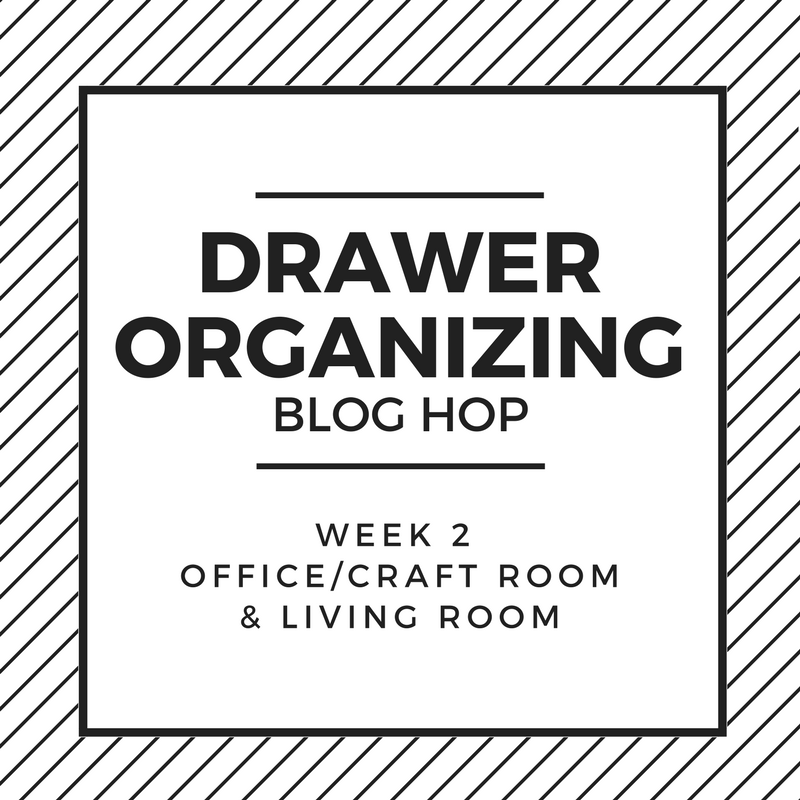 This week, we focused on drawer organization in our Office, Craft or Living Rooms. I chose to organize my pull-out craft bins with my fabric stash. I had two large plastic containers stacked full of fabric and fabric scraps. While this storage system works, it was really hard to find fabrics when they are stacked on top of each other. So instead of stacking, I’m going vertical! Since I have a lot of fabric, vertical fabric storage using foam board is a much better solution. Storing fabric vertically allows me to quickly see my fabric inventory and I can separate fabrics by yardage,color, and seasons if needed. You can buy comic book boards or fabric storage boards, but I needed custom sized boards. Using dollar store foam boards was a quick inexpensive solution for my storage bins. Organize fabric into keep, donate, or sell (sell on Craigslist, Facebook, or Ebay) piles. I know parting with fabric can be hard, but be brutal here. Only keep what you know you will use. Go back through the piles and sort further. For example, sort by yardage, color, fabric, seasonal, etc… Sort the fabric in a way that makes sense for you. I sorted my stash by yardage, color, and seasonal. The size of the cut foam boards will depend on the size of the drawers/bins. My bins are large 13″ x 15″ x 13″ that fit inside the Ikea Expedit I recently moved into my tropical oasis craft room. Measure your drawer or bin and cut the foam board about 1/4″ smaller than the inside width of the drawer/bin and at least 1 1/2″ – 2″ shorter than the height. My foam boards measure 12 3/4″ x 11 1/4″. I got two 12 3/4″ x 11 1/4″ boards out of one standard sized 20″ x 30″ foam core board and two smaller boards. For smaller lengths of fabric, use the leftover foam board cuttings. These should measure 12 3/4″ x 9″. Leaving the fabric folded the way it came off the bolt, fold it once more in half down the length and wrap around the foam board. When the fabric is wrapped around the foam board, pin one side to keep in place. This bin shows fabric using the large foam board and has fabric with 1 1/2 yards or more. I currently have 21 foam bolts of fabric in this bin. The amount will vary depending on the yardage of each fabric. This bin shows fabric using the small foam board and has fabric with 1 yard or less. Insert the fabric wrapped foam boards into the drawer/bins. Organize by color. I love vertical fabric storage! I can see my fabrics and can easily grab what I need without digging through a container and taking everything out. Have another way to store fabric? Leave me a comment and tell me what works for you! I’ve heard of the KonMari method. I really like storing things vertically as it’s so much easier to see everything when it’s not piled on each other. To save money, one can also wrap the fabric around cardboard boxes. How clever! I am so on board with the vertical storage as I am a HUGE fan of the KonMari method. I store most of our clothes vertically, totally makes sense to store fabric like this as well! OK this is GENIUS!! I have two square bins with all of my fabric in them neatly folded and stacked, but I forget what fabric I have unless I empty out the bins. I need to do this. I love this! I have so much fabric in piles so this is something I really must do. This is a great idea. What a great idea! I can’t tell you how many places I have fabric stored (or shoved in). I’m going to give this a try. This is one of the best organization tips I’ve seen. It’s also one of those “why have I never thought of that” moments! I have a bin full of fabric and it’s always a mess to sort through. This is an idea I’m going to put to use. Thanks for the tip! I totally love this idea. Fabric can quickly take over the craft closet at my house! My daughter got smart organizing my fabric and she used foam board to create sections but I like this idea even better. Just added this to my to-do list! I purchased foam board this week for bedroom drawer organization, hope it works! I don’t have a lot of fabric, but if I did this is perfect. What a great way to see what you have and it keeps it so neat. You have some super cute fabrics.